On May 19, EgyptAir Flight 804 dropped out of the sky. Only pieces of the plane have been found so far, and while more than 60 people are presumed dead, the exact cause of the plane’s downing is still unknown. Here’s everything we do know about its mysterious loss so far. EgyptAir Flight 804 was a regularly scheduled flight between Paris, France and Cairo, Egypt. On the day of its crash, it was carrying 66 passengers including seven crew and three security personnel. The plane involved in the crash was a 12-year-old Airbus A320. The A320 was first introduced in 1988, and is regarded as a workhorse of short- and medium-haul flights. More than 4,000 have been built, and both smaller and larger variants, ranging from the A318 to the A321 depending on size, have come into service over the years. The particular aircraft involved, registration SU-GCC, made five flights in its last 24 hours, making stops in Tunis, Tunisia, and Asmara, Eritrea, along with Paris and Cairo. The plane took off from Charles de Gaulle, Paris’ main international airport, departing at 11:09 p.m. local time. Though the plane was scheduled to land in Cairo at 3:05 a.m., it disappeared from radar 35 minutes before its planned arrival. Right before whatever it is occurred that took the plane down, it was flying at 37,000 feet, a normal cruising altitude for the aircraft and the flight. The captain, Mohammed Shoukair, had more than 6,000 flying hours under his belt, including more than 2,000 flying hours on just the A320. That’s the equivalent of almost three months in the cockpit. The co-pilot, Ahmed Assem, had 2,766 hours of total flying experience. The location in which EgyptAir Flight 804 disappeared from radar. Exactly what happened in Flight 804's final moments remains subject to debate. The Greek Defense Minister has said that the plane made a sudden 90-degree left turn, before going into a full circle to the right, and then finally plunging, CNN reports. But the head of Egypt’s National Air Navigation Services Company said that none of that actually happened. The plane’s “black boxes,” containing flight data information and the last 30 minutes of noises made in the cockpit have not yet been found. Either one may shed light on what happened, including definite flight path, air speed, altitude, and any conversations between the flight crew. In the past, noises from explosions have been heard as well on flight cockpit recorders. Right before the plane disappeared, the plane’s Aircraft Communications Addressing and Reporting System (or ACARS) automatically sent a message reporting smoke in both the front of the aircraft and in a bathroom. The alerts are sent without pilot intervention. The ACARS signals indicating smoke do not necessarily indicate fire or explosion—they can also be generated in extreme cases by fog, which is often a result of the extreme condensation seen due to large and sudden drops in cabin air pressure. An unnamed commercial pilot told the Telegraph that other parts of the ACARS data log indicated that the right front and side window were blown out from the inside, indicating an explosion. The plane last made voice contact at 1:48 a.m. with Greek air traffic controllers, with nothing unusual reported. Greek ATC made another attempt to make voice contact at 2:27 a.m., and received no response. At 2:29 a.m., the plane disappeared from radar. At 2:45 a.m., a search was launched. Teams from Egypt, Greece, France, and the U.S. Navy have all been involved, including American aircraft and an Egyptian submarine capable of diving to more than 9,000 feet. The black boxes have not yet been located, however they are designed to emit an ultrasonic “ping” for up to 30 days, and are capable of surviving depths up to 20,000 feet. Here’s where things start to get dicey, and do wade into speculative territory. That being said, it’s rare for airplanes to crash. It’s even more rare for planes to crash because of an explosion, as evidence thus far appears to indicate. In the past few years we’ve seen crashes of Airbus A320s, like Germanwings Flight 9525, which made a controlled descent into the side of a mountain due to a suicidal co-pilot, and explosions that brought down aircraft, like in the case of Malaysian Airlines Flight 17, though that was due to an anti-aircraft missile fired at the plane. Egypt has a history of terrorism-related incidents. 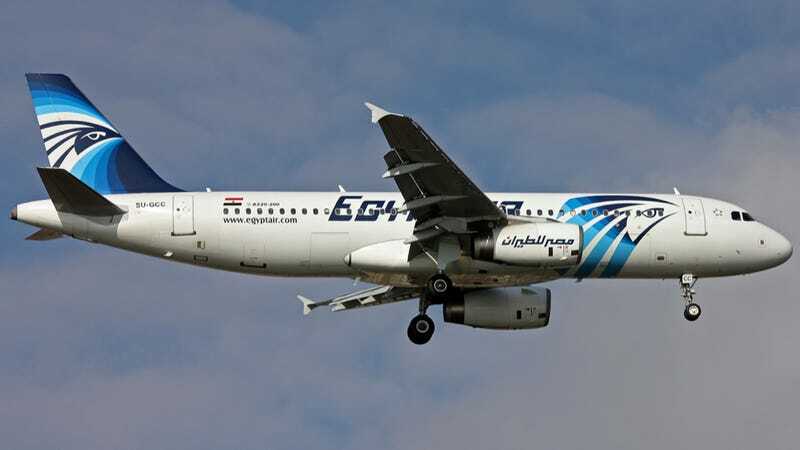 In 2015, Metrojet flight 9268 was brought down over Egypt’s Sinai Peninsula, in an attack that terrorist group ISIS claimed responsibility for. EgyptAir, and the Egyptian government, have a history of steering investigations towards pre-determined findings. The crash of EgyptAir Flight 990, which slammed into the Atlantic Ocean in 1999, was determined by Western aviation authorities to be caused by a suicidal co-pilot. Egyptian authorities and media, however, contested that finding, and proffered a number of alternate theories, many of which seem to have veered into conspiracy territory. All of that noted, no terrorist group has yet claimed responsibility for any attack. The very plane that crashed last week was tagged with Arabic graffiti saying “we will bring this plane down” a few years ago, the New York Times notes, though that’s not really indicative of much. It could’ve been a warning from an organized terrorist group, it may have just been dumb vandals. Terrorist groups usually claim responsibility pretty quickly, but that’s not always the case – and some of those claims of responsibility can be spurious, as individual groups attempt to raise their profiles. But even then, most terrorist attacks go unclaimed. As Slate noted in 2014, 86 percent of terrorist acts go unclaimed. A lot of terrorist groups have conflicts with the French government, the Egyptian government, both, or neither, any of which could have spurred an attack. Terrorism doesn’t often make a lot of logical sense. But even then, we’re making the assumption that because there was an explosion on a plane, it had to be an act of terrorism, or from some external influence. That’s not always the case, however. Spontaneous, accidental explosions have occurred on planes in the past, like in the case of TWA Flight 800, as multiple investigations found. Spontaneous, accidental explosions are even more rare than the highly uncommon general aviation incident. So it’s also a bit unlikely. The investigations are ongoing. Hopefully this mystery will be solved soon.